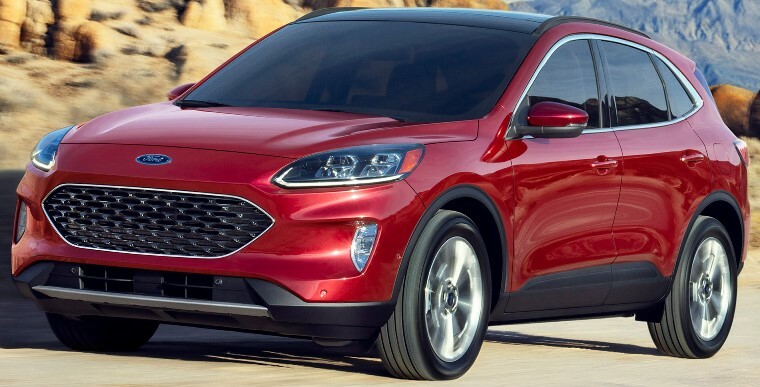 The completely redesigned new 2020 Ford Escape will be powered by one of two EcoBoost® engines or the all-new hybrid powertrains that targets an EPA-estimated range of at least 400 miles per tank with the standard front-wheel drive hybrid getting an estimated range of more than 550 miles. There's a new 250 horsepower 2.0-liter EcoBoost engine, available on the Titanium model and when properly configured, rated to tow 3,500 pounds. The all-new 180 horsepower 1.5-liter EcoBoost is standard on S, SE and SEL, and when properly configured, rated to tow 2,000 pounds. The SE Sport and Titanium models come standard with Ford’s fourth-generation hybrid propulsion system, which includes an all-new 198 horsepower 2.5-liter Atkinson cycle hybrid engine and electronic continuously variable transmission. The plug-in hybrid variant, available on every trim level except S and SE Sport, projects a range of at least 30 miles in electric-only mode. Escape comes standard with Ford Co-Pilot360™, and offers driver-assist features such as Adaptive Cruise Control with Stop-and-Go and Lane-Centering.